NEW YORK (WABC) -- Subway service has been restored with extensive delays after a water condition Monday morning at the West 4th Street station. The MTA says there was water on the tracks because of frozen drain pipes, so power had to be shut. The drains were cleared of ice and water, and service was restored. F trains were running on the E line from Jackson Heights to West 4th. M train service was suspended between Forest Hills and Essex Street, running from northern Queens to Manhattan. A, B, C, D, E, F, M and R train service resumed with delays. 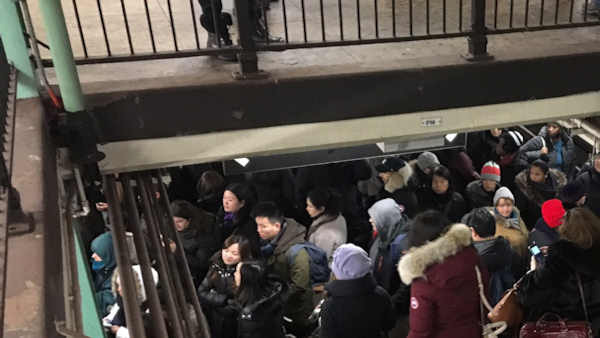 Straphangers tweeted about packed trains and platforms, and long waits for trains because of the service changes.